Crime Prevention Through Environmental Design (CPTED) is practiced at the College of Coastal Georgia. Campus Police are called upon to assist in future buildings and their designs to ensure the upmost safety and security measures are in place for our students, faculty and staff. Our Department has specially trained Campus Crime Prevention Officers. 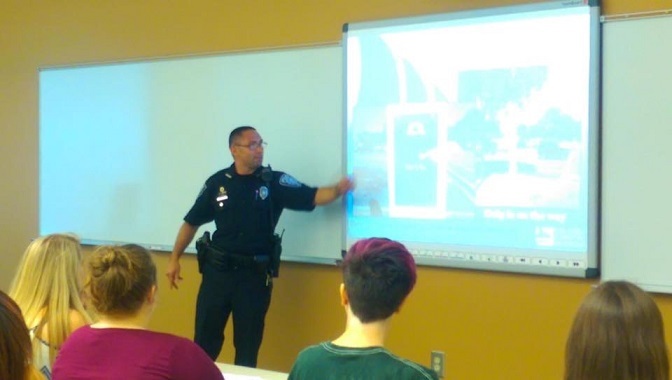 They conduct classes for the campus community covering topics such as personal safety, internet security, safety while traveling, theft deterrents and anti drug campaigns. They offer risk assessments to buildings, parking lots and other area of the campus. Our Crime Prevention Officers also meet and greet all new students as well as parents during orientation programs. This allows the newest members of our community to get to know their officers and understand the how to stay safe while attending the College of Coastal Georgia. Lock your vehicles and dormitory rooms. Use a U-type lock on your bicycles. Stay in well lit areas and try to travel in pairs. Never leave your laptop, phone or books laying in an area unsecured. Keep minimal amounts of cash on your person. Don't leave high dollar items in plain view in vehicles. Report any and all suspicious activity to Campus Police at 258-3133. Computer and phone scams are a common problem for college students, If it sounds too good to be true, it probably is.